The first thing I did was "join" the 5 o'clock club! The time I have in the morning with just me and the Holy Spirit and His written words have been invaluable to me. At first it was difficult but now, when the alarm goes off, I get a little feeling of joy and excitement to get out of bed and get started. I know that it is the Lord who provides that motivation because I am being faithful to keeping time with Him a priority. I like to look at it as getting dressed and ready for the day before I physically get dressed and ready - I'm getting my heart prepared for the day and putting on "the full armor of God" (Eph. 6:13 - "Therefore take up the whole armor of God, that you may be able to withstand in the evil day, and having done all, to stand firm." It makes me a better wife - my husband wakes up to me with his breakfast, lunch packed and a kiss out the door; my kids have a mommy that is showered and prepared for the day with a heart that has joy, patience, and is ready to love tenderly. And for me, I have the house ready to go and the day planned ahead of me just waiting. Sure, I am a little tired at night but that actually works out well because I am ready for an early bed time with my husband. Rising early along with a couple of other things that I have started have got me on a much better track and able to serve my family in the way that God wants me to. I am a single woman who has been out of college a few years and am just trying to figure out what that should look like while all my friends are walking down the aisle. :) I have jumped on the 5 O'Clock club bandwagon. It has given me such sweet time in the morning with the Lord and productive time to straighten the house up, etc to serve my roommates (hopefully one day a husband). This morning was the first morning that it wasn’t painful to get out of bed – haha! I think my body has finally adjusted!! I am so grateful for your rich wisdom that I can prepare NOW. If He wishes, I want to be a wife and a mom that is practiced and delights to rise early to serve a family. I am PASSIONATE about family and the roles of a husband and wife and being a mommy! Even if that doesn’t come, I can be a helper, a keeper of my home and can pour into children at my church! He is good. Always. My husband has been quoted as saying, “The 5AM Club is the greatest thing for our marriage!” After reading Shopping for Time, I have adopted this habit and it HAS been so good for our marriage. I currently work outside of the home, so the only time I seem to be able to care for our home is briefly after work…if we don’t have a home community or date night. When I get up, I’m able to read, pray, plan and care for our home before I even walk out the door to go to the office. When I’m done at 5pm, I’m ready to come home and give my husband my all…not my left-overs. Only by God’s grace (and my sister-in-laws calls each morning) am I able to get out of our warm bed and get my day started off right. Sitting at Jesus’ feet first thing sets the tone for my day, leaving me still joyful and energized after a long day at work. I get to focus on my man instead of the dishes and that makes him happy. The sacrifice from 5:00 to 5:05 before the coffee kicks in becomes well worth it when my husband feels like he gets my full attention at night. When I spend the first portion of my day with God, life goes better for me and my family. It's that simple. I need Him to take over before I can be the wife and mom He wants me to be. Well, being 15 and still in school, life can be pretty hectic for me. I want to have a quiet time every day, but sometimes I sleep in, due to staying up late the night before doing homework. The Lord convicted me that I needed to put my time with Him first. Before anything else, even making my bed. So, I'm doing the 6 o'clock club (because 5, well that's a little early. :)) because I know that I need to give my first fruits to the Lord and not anything else. For the past three weeks waking up in the morning has been a HUGE struggle! Each night I would dread the thought of having to get up the next morning. I would complain to my husband and ask if I could call in for a mental health day. I even asked him if we could skip church last Sunday just to get some extra Z's! I kicked around the idea of joining the 5 O'Clock Club all weekend, thinking I would try, and probably fail, to get up on time on Monday morning. I told myself I would just try it out, but not really go through the process of registering. Well, this morning, by the grace of God, I got up at 6:30 am! I spent some much needed time with my Savior, got ready for the day, greeted my husband with the perkiest good morning he has heard in a while and was even early to work! It was GREAT! It's after 4:00 pm now and I am still feeling refreshed. I can't wait to meet with God again tomorrow morning. I am confident that he was totally at work this morning dragging me out of bed and it will only be with his help that I will be able to do it for the rest of the month. I am so excited for this and for what he will teach me in the early morning hours. Thank you all for sharing this great idea with us and for all the encouraging words. I am a mother of 4 kids under the age of 5. It has been such a challenge for me to get up in the morning before every one arises but I know that God WANTS me to do this. A few weeks ago a friend and I joined this club. After reading the blog I was really wanting to do this but I needed accountability. So the Lord lead a far away friend of mine and I into a conversation about our struggles to get up in the morning. I sent her the things from the post about the club that really challenged me and we decided to do this together. We keep accountable each morning via a short e-mail stating "I'm up." The first week was great. I was so excited and I would be actually ready to get up, but as time has moved on I sense the battle of keep going. It has been nice to talk with my friend and be accountable because we pray for each other and encourage one another to keep "pressing on." I can say that I have enjoyed the quiet times with the Lord. He has been faithfully teaching me the importance of communing with Him through His Word and prayer. It certainly prepares you for the battle for the day ahead of you. I have been putting off getting up early for years now. At first I was chronically sleep deprived, and later had sleep issues resulting from my body being out of sync. But now I am sleeping well, and I love it. Too much. About a week ago, my 8 year old said, "I love reading my real ESV Bible. I should read it every day." I responded, "Well if you do it first thing, you'll never get distracted from that good desire." Pang. Guiltily I figured I would have to put that on his school schedule instead, since I am not up to help him. This morning, as I sat during my 5 o'clock club meeting with the Lord, I was praying for my boy, asking God how to lead him gently toward his own desire, without it turning into a "check off the list" thing like his math or spelling. I prayed, "Lord, show me how to encourage him to read his Bible." And guess who popped out of his bedroom at that VERY second? My little buddy! He is an early riser, but this was particularly early at 5:45. And I was able to say, gently, "I am reading my Bible. Would you like to?" He grabbed his Bible and sat quietly next to me. I realized, it's very difficult to encourage others to commit something to the Lord, when I have not done so. And how sweet and easy the encouragement flows, when I am the visible, real example. It's not about my kids. It's about Jesus. But I know God set that up for me today so I could see His glory revealed and be encouraged in my weakness. I have been a Christian for 20 years, I have had devotions consistently, but never consistently early in the morning. This morning as I sat with my Bible in my lap and listened to the silence around me I understood why the morning is so sweet. No disruptions or thoughts of what to do next--just worship my lord and saviour. I think one of the testimonies is one I sent in a year or so ago. I am definitely fine with it being used but would you mind taking out the part of having a difficult family life? I have some friends of the family that might look at this and don't want to cause any issues with my family. Thank you so much!! Thankful for you all. If you told me a month ago that I would be waking up at 5:30 every day willingly, I would have laughed uncontrollably. If it's one thing that I'm known for, it is my love of sleep and the danger someone puts themselves into if they dare wake me up before I'm ready to get up. (I've been know to throw punches. And no I'm not proud of that. :D) As an irresponsible and undisciplined typical American teen, there is little that I do without complaining or with passion, unless if its surfing the Net or hanging out with friends. I grew up in a Christian home and my parents always underlined the importance of reading God's Word. And I knew that. And I did try to read every day. Honestly. But I always seemed to have more important things to do. I mean between school and napping and homework and watching TV shows on the computer, I was really pooped by the end of the day, which left only one option left. I'd look at my Bible on my desk, mumble "Tomorrow" and would collapse on my bed with fatigue. A couple of weeks ago, I began to feel a deep dissatisfaction with my self. There were several areas in my life that needed to be cleaned up and I needed to change several things about my attitude and relationships with people. I was easily irritated by other people, it took little to make me angry..the list goes on. When I saw the 5 O'clock Club signs ups, I just shrugged and said "Why not?" I can't say I was excited, more resigned than anything. But that quickly changed. I kept at it for a week and I could finally look my dad in the eye (who gets up much earlier for work then I do. He is the ultimate example of discipline.) Then I realized there was even a greater result. The wisdom that I read and received every day in the morning from the Bible, guided me the entire day! I especially love it when the text I'm reading has something to do with holding my tongue or kindness (the two things i struggle with the most.) Instead of the guilt that I expected for not being able to measure up to God's perfect standards and commands, I found myself delighting in them and desiring their guidance all the more. I'm truly beginning to realize the meaning of putting on the armor of God FOR battle. I'd usually only read the Bible at night, and though I have nothing against that now, I realized that putting the armor of God after a day is gone, after a battle was fought, was not nearly as edifying as putting it on at the very eve of the battle, at the very dawn of the day. And quite unbelievably the things that I have been trying to change for quite some time, stopped feeling like immovable brick walls that I had been beating my head upon. I began to have breakthroughs! For example take exercising. I despised with a passion the discipline required to exercise every day. Yet as I read in God's word about the lazy man and then successful man, and of how my body is God's temple, instead of saying that I would start tomorrow (as I had when I read the Bible at night), I began saying "YES!! I will do this today!!" And trust me sisters, I struggle getting up early. You're talking about someone who adores to sleep. I have been tempted to hit the snooze button many times already and sadly I have succumbed to it a couple times. Yet I continue setting the alarm halfway across the room, for 5:30 because the pros of getting up to spend time with God greatly outweigh the few measly moments of sleep your flesh desires instead. Praise be to God! And thanks to Him for His grace! After an unsuccessful attempt to go it alone in getting up early, I quickly discovered the need for support. It was all to easy to turn the alarm off when there was no one else to hold me accountable. In addition to that, there was no one else with which to share the fruits of my time with the Lord, and vice versa. I found more consistency and success when my friend agreed to keep me accountable. Every morning, I texted her when I got up. If I passed my five minute "grace period," she would give me a wakeup call. Four days went by, and I was feeling good about my "streak" of success. The fifth day, I hit the wall and hit it hard. Not only did I turn my alarm off, I turned off the phone. Two hours later, I slid out of bed, feeling guilty and hopeless. "I messed up, now I've forfeited God's blessing for the day." Not a good mindset to enter into your day or time with the Lord. I texted my friend that my "streak" had ended. She replied with an answer I didn't expect. "Oops, that happens. The streak may have got hit but you still look the same to Him. You have all day to enjoy His Grace. Love ya!" This reminder that God doesn't judge me based on my performance encouraged me to spend time with Him in spite of my failure. And you know what, He blessed the time immensely! This experience of "failure" taught me another valuable lesson about accountability. When you fail, it helps to have someone there who can help you get back up by reminding you of the truth that failures don't change how God sees us. They are not just there to make sure you follow through. They are there to rejoice with you, to share in the fruits of grace, and to help you get back up when you fall. In the past, I would usually wait to get my kids off to school and my husband off to work before having my devotions. But since making the commitment to get up earlier, I've noticed 2 things. The morning routine is one of the most hectic times in my day; but now, instead spending the beginning of my quiet time confessing how I lost my patience or wasn't expressing love to my family as I should have, I find that, having quieted my heart before the Lord, I am better prepared to face the morning rush. I also was thinking of how growing up, I would always wake up to find my mom reading God's Word and spending time with the Savior she so dearly loved. What a great encouragement it was to know that before I had even awakened, my mom had brought me before the Lord in prayer. Now I have the opportunity to be that same encouragement to my children. I never really offically joined the 5'OClock club. But my new year's resolution was to exercise, read my Bible everyday and have a more devoted prayer life. So, I started getting up around 4:20 AM. I go workout at the gym for 30 minutes. When I get home from working out, before I do anything else, even showering, I read my Bible because I am a wake from working out. Then I have my prayer time and to help my mind to stay on track and not wonder to the days events or to sleep, I write my prayers down word for word in a journal. I do all this before my family even crawls out of bed for school. So, for not offically joining the 5'O Clock Club, I am up early and spending time with my Savior. This has made a HUGE difference in my life. I am not feeling stressed or rushed with my time with God. I also feel like I am starting my day out at peace and less stressed before I hit the grind of the day at work because I am starting my day out with my Savior and keeping things in the right priority. Christ first!! Silenced in the presence of the Lord… Even though it wasn't a 5 O'Clock in the morning, it was morning and it was during a one month trip trough Europe. Together with a very good friend we started this journey not only to discover places but to get to know God in a deeper and different way. One of our rules was to read a Psalm each morning and each evening and to pray… but we never had a rule to be silence in the presence of the Lord. But one sunny morning, in Krakow, Poland, we had our time with the Lord in a park and we read Psalm 5, and in the 3rd verse it says "I lay my requests before you and wait in expectation." And then we suddenly remembered what we read the evening before: Psalm 4:4" …when you are on your beds, search your hearts and be silent." When we first tried to be silent it was really hard. All sorts of thoughts came into our minds but after a while we discovered the beauty of a silenced expectation. Some may say this kind of things become routine; I would say this kind of things are spiritual exercises (and I don’t refer to some sort of exotic mediation) that help us grow and become more eager to spend time with our Lord. I've resisted getting up early for a quiet time for most of my marriage. I've always been a night owl and did my best work after 9 pm. Once I started having babies, nursing, and just generally being exhausted, I justified that I couldn't possibly get up early as I was just too tired. I NEEDED my sleep. Then the kids started getting older and I was diagnoses with hypothyroidism, so then I had ANOTHER excuse for NOT getting up early. After all, I had to sleep because I could never be completely sure if it was my thyroid making my so tired or just (dare I even say it) lack of discipline. When I read Shopping for Time, I knew it was time to lay all the excuses aside. 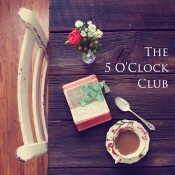 I snooped around the blog but couldn't bring myself to actually join the 5 O'Clock Club. I reluctantly set my alarm for 5:30 am. I had no plan, but stumbled groggily to my computer to look for a reading schedule to read through the Bible in a year. Then it hit me. Part of why I'm so rotten at being consistent with a quiet time is that often I can't find my Bible (it gets used in homeschooling, kids borrow it, I leave it in the car, etc.) or the latest devotional I'm reading...so why not see if I can do it all online. To make a long story short, I've bookmarked my Bible reading plan, a devotional I'm working through and a couple of inspirational blogs I like to read but never seem to have time for. I started a private blog of my own to chronicle what I read each day and give me a place to record my thoughts. I gave permission for a few close friends to check in on the blog and hold me accountable if I don't post anything for a day or two. So far, I'm LOVING it. I'm on day 20...and it's still hard to make myself go to bed earlier, but I'm getting better. I woke this morning at 5 am on my own, feeling great, so I'm know I'm making progress. The thought of doing this for the rest of my life is overwhelming, so I just tell myself I only have to do it tomorrow, just one more day. I now have the courage to be "official" so I've joined the club. Thanks for the encouragement. Good Morning!! I signed up for the club a week ago and that is how long it has taken me to actually get up on time!! After, dropping my contact & almost putting the coffee in a filterless machine, I was able to sit and worship my Savior. This morning I found him to be the Good Shepherd who willing put his life down so that He could take it back up again... all because He loved me! His mercy has met me this morning and you girls have been a part of that. Thank you!! So today was my first day of being a member of the 5 o'clock club. I woke up at 5 am with ease, ready to start my day with prayer and Bible study. I got about 5 minutes into my prayer when I hear my 3 year old daughter crying and screaming. She comes out of her room, and I pick her up to ask her what's wrong. Then I find out as she vomits on herself and me. Not exactly how I intended to be starting my day out!! BUT I kept praying as I tended to my daughter. I praised God that He woke me up and allowed me to be fully awake to care for her in the gentle (not grumpy) way that she needed me to. Although this 1st day didn't start off in the way I had planned, I know I serve a sovereign God. And I will continue to wake up early so that I can know Him more fully! I joined the 5am club and I am usually a morning person. But most days I see my duties first thing in the morning, so I have made a commitment to "think on things above, so no computer, no dishes, no laundry............ I make my coffee and while it brews I pick up a few things around the house. This has been helpful for me as I know the importance of my pursuit of godliness for my own life. I forgot to mention, that when I wake up it is a benefit for me if I do not have the thoughts of my daily duties but think of the plan I have to feed my soul with God's word. Of all the wisdom shared in Feminine Appeal, one of the single greatest practical influences it has had on me is this habit of rising early, and seeing the value and joy of doing so. Rhythms of life, with now three young children, keep changing, but this single element of my life holds like an anchor and is precious to me. It is not the habit itself that is inherently precious, but the communion with Christ that it has enabled for me and in me. Rising early is no guarantee that I will have sweet communion with Christ. But, practically speaking, rising early is the greatest guarantee that I will have time in the day for communion with Christ. And by His Grace, rising early has been a tool leading directly to that end, and thus of invaluable worth. Thank you for your continual encouragement. I smile to look over the long list of fellow women in the 5 O'Clock club. Kindred Spirits. All praise to Christ. I discovered this blog a week or two ago and clicked on this 5'o'clock club wondering what it was about. People committing to getting up at 5am to have their quiet time?! Wow! Simultaneously, I thought 'I could never do that', and, 'I want to do that'. The next day I tried and failed. I couldn't drag myself out of bed. The rest of the day I felt so disappointed, but I also prayed many times that God would get me up the next day. He did, and every day since. I am astounded at just how wonderful it is. I am able to spend two hours every morning with the Lord. I am a mother of four young children, and that amount of time seemed totally out of the realms of possibility a few weeks ago. And yet it is something I always longed for. I am not a morning person, and it does hurt to be up that early (until I've had my cuppa), but every morning when the kids start waking up, I am dancing inside, exclaiming 'I just spent two hours with God!!' I am discovering new things in his word, contemplating them, systematically reading his word, praying for myself and my family and lots of other people and singing praise. I consider it the craziest thing I've ever done. But I figure Jesus deserves a crazy commitment. Three years ago when our first son was born, we were not at a place financially where I could stay at home. Selfish and prayerless decisions, unwise counsel, and the help of a poor economy turned us upside down in our mortgage on top of our other debt. We were stuck. Through fervent prayer and petition, savings, and paying off debt the next two and half years, the Lord worked miracles in our finances and faithfully answered our prayer. This October I was finally able to quit my job and stay home with our two sons. The transition, although joyful, was harder than I anticipated. Through the help of Proverbs 32, read over and over and over again, and the words in Titus 2, God is teaching me about this gift of marriage and motherhood He has called me to. While working two full time jobs a as a nurse and a mother, my husband and God got the back burners. Getting up at 5 was a necessity to get everyone ready and out the door, but I had zero energy to get up any earlier to have devotional time or care for my husband. Now that I am at home, although we have chaotic days, in the roles God has called us to be in, life is much more settled. I took a break after quitting my job and slept in for many mornings. Convicted by my husband's example of getting up early for hours of reading time (and him making his own lunch for the day), and seeing your New Years blogs about the 5 O'Clock club, I decided it was time. I have been getting up with my husband in the mornings. We have sweet devotional time in the morning, either together or individually in each others' presence, reading and sipping our coffee by the fire while the house is still. I have deeper love and affection for my husband, I have more patience with my children, and most importantly, I am growing even deeper in my knowledge and devotion to our mighty God. This morning I placed my husband's lunch on the counter, placed his breakfast in front of him, and began to boil water for his tea to go. He said, "B, you are a great help to me in the mornings." In my heart I felt a small, little victory. Thank you husband for your words of encouragement. Thank you Jesus for a husband who encourages, and for the quiet 5 O'clock hour which allows me to focus and prioritize my day: God, husband, children. Oh God, you are so faithful. I set THREE alarms for this morning. The Lord in his infinite wisdom woke me up at 3:28 am to let me know that I had two hours until my appointment with Him was scheduled to begin. I didn't even need the second alarm. I was out of bed and at the coffee pot at 5:30 am on the dot. God revealed so many truths to me this morning, I almost feel spoiled. My new favorite scripture is Zephaniah 3:17...it tells us that The Lord will sing over us! What a thought. I pray that I will continue to bask in his love for me and keep my dates with Him daily. As I write, I am wrapping up my morning meeting with the Lord. In ten minutes, the oldest of my 3 small children will come bounding into the office where I have been studying and praying. Like many others that have written to you, I enjoy the warm comforts of my bed and do not enjoy getting out of it! A few weeks ago I clicked onto your blog and as I began to read the stories of women rising early and carving out that time in their day, it made me cry. I struggle with finding time to study and pray--for years my husband has been gently encouraging me to wake up early to do this, but for some reason I couldn't do it until I saw the stories of other mothers that were doing it. Not only is it such a blessing throughout my day to have my eyes and heart fixed on Christ from the start, it is such a blessing for my five year old son to sneak up behind me each morning and see an open Bible on my lap; he usually pulls down his illustrated Bible and cuddles up with me for a few minutes. My prayer is that he would remember these times throughout his life and make it a tradition of his own! I am prone to inconsistency, so even as I write, I am praying that this will become a lifelong habit. Thank you for sharing your club and for encouraging a even a sleepy sinner like me study and pray when I would usually be in bed! I want to express how thankful I am for this community of women getting up early to spend time with the Lord. I am a senior in college and my sister Caroline, a freshman, is living with me. This semester we have gotten up at 6:00 every morning for an hour of quiet time before we have to get ready for class. Up to this point, my college career has been filled with frustration at my difficulty in making the time for prayer and study. I am so thankful that the Lord finally pulled me over that hump, and that my sister can start this habit much earlier than I did. We have enjoyed this time so much, and the accountability with each other has been strengthening. It will probably become more difficult as the late nights of studying get later and later throughout the semester, but by God's grace we will persevere! A friend and I have also started calling each other every morning. The knowledge of the commitment of all the members of the 5 O'Clock with us is part of my motivation in getting up in the morning. Thank you so much!